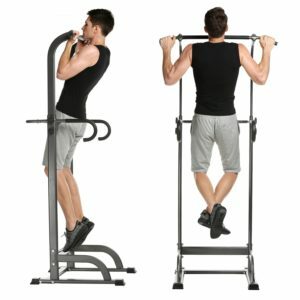 This Ancheer is a basic but very decent quality, brand new, adjustable and multifunctional exercise power tower for home gym for push-ups, pull-ups, chin-ups and other exercises to work your triceps, biceps, back and abdominals- core section with functions of arms support, chin-up and single parallel bars and more. It is suitable for use by people of all ages, for kids to grow, young, middle aged and elderly whether they are beginner or advanced. It is quite a solid and durable unit with triangle strengthening reinforcement, dual valves and solid gasket along with anti-slip and wear-resistant rubber ring pattern and non-slip end caps to keep the power tower and you in place. 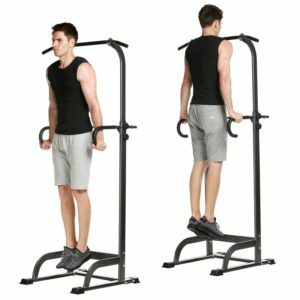 Despite the lower price it is quite a stable tower with a shipping weight of just under 44 pounds that can have a user weight of 300 pounds in total and the adjustable height can go up to almost 90 inches from the minimum height of 70.2 inches as assembled. Black Ancheer is made of steel and imitation leather and it not only seems to be sturdy but also comfortable with foam padded grips. Overall height of the tower from the floor to the top is 80.73 inches and the bottom part measures 30.42 x 23.35 inches so it doesn’t occupy a lot of space at all, middle handle is 22.62 inches long and the top handle is 36.66 inches. One of the customers said that although the tower is great for money, the middle handles can move in and out during dips and doesn’t feel too stable and as we don’t have the unit on hand, by checking out the photos we can kind of see what they mean by that and it is most likely to be an assembly issue and they may need to tighten things properly and overall it is quite sturdy. Just like with any exercise equipment you get from online or even shops, it is sent in a box- properly packaged but unassembled but the assembly shouldn’t take more than 30-40 minutes even when you do it alone and even better if someone is helping you out. There is not a lot to be said for such a robust and solid power tower with a low price tag, except that it does the job well and offers very good value for your money. It is something you and your family can use every day as it is quite well built with solid steel and doesn’t shake or wobble when you work out.